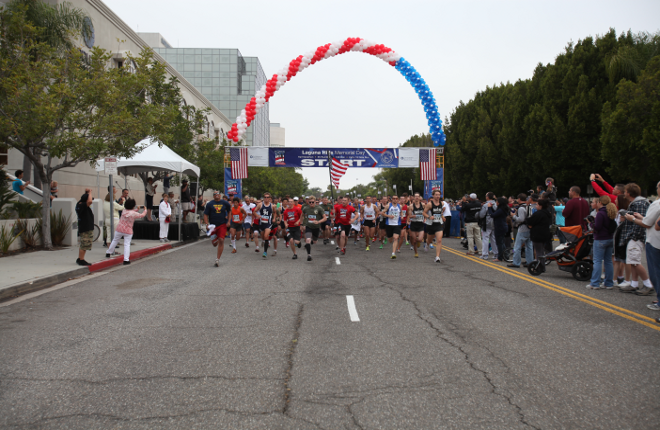 Picture Of The Laguna Hills Memorial Day Marathon. We Provide Limo Service For All Sporting Events. When looking for quality transportation in Laguna Hills, we offer luxury and dependability limousine service. We understand that your event or occasion is import to you and it is our goal to provide you with the utmost care rather if be for your wedding, business event or night out with friends. We have you covered with our Laguna Hills luxury transportation services that gives you and your guest comfort and luxury limo service that you deserve. Our limousine company offers a complete fleet of limousines, SUV limos, late model sedans, corporate vans, limousine tour buses, party bus and limos for service in Laguna Hills and all of Southern California: Orange County, Los Angeles, Riverside County and San Bernardino County, CA. We cater for all corporate events, conventions, business meetings, luxury airport charters, Orange County sightseeing tours and special VIP Limo services for your clients; such as airport meet and greet services, nights on the town, Temecula wine tasting tours, social events, weddings, and customized limousine services in Laguna Hills, CA. Whether you are in need of an airport transfer, Orange County tour, or group charter, our live dispatch team is available to place or change your reservation 24 hours a day and seven days a week. Call us toll-free 844-4-ALS-Limo. Ace Transportation Services also provides airport transportation services to and from Laguna Hills to and from the Santa Ana – John Wayne Airport (SNA), Ontario International Airport (ONT), Long Beach Airport (LGB), the Los Angeles International Airport (LAX) and Cruise Port (PIER). Our airport limo transfers are at affordable fixed rates, and are available for groups, individuals, and corporate accounts. This is safe, prompt and reliable Laguna Hills airport transportation services.